Connections. This was the word I tucked into my heart to serve as my intention for my recent pilgrimage to Ireland. How would I do this? By listening, being present, and being open to this adventure. How did it work? Yes, I did make connections, but also discovered (and am learning from) unexpected divisions. I will write later about my other connections, but today want to share with you where I experienced God on this journey. God appeared to me in the four elements in wild and mighty ways. 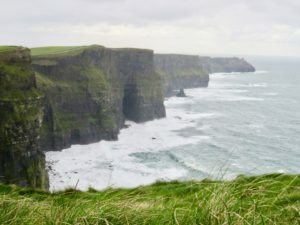 I giggled and danced with God’s hurricanelike winds at the Cliffs of Moher. He bounced me around reminding me of his power and his presence. Exhilarating joy bubbled up in my heart and the desert place in my heart erupted with refreshing waters. God was there, beyond my imagination and out of my control, yet present for me and all to know and touch. 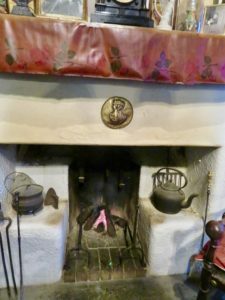 I smelled God in the burnt and smoky aroma of peat fires still burning today in the pubs and homes of Ireland. This ancient way of using what the land provides – something that otherwise would be useless and unused brings warmth and a cozy inviting environment to welcome the Spirit and the human spirit (and perhaps sip a little spirit too). God was there in full fragrance. 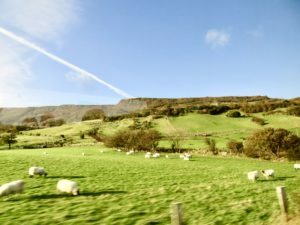 The mystical landscape of Ireland reminded me of the vast gift of earth from God to us. The beauty of mountains, winding paths, crashing waves, rugged cliffs, hedgerows between pastures, hills dotted with millions (yes millions) of sheep, misty islands just beyond reach and palm trees. Palm trees? Yes, I was surprised to see them too. God was there, presenting earthy beauty and unexpected discoveries. And water – One of the most frequent questions I am asked about our trip is this: Did it rain? 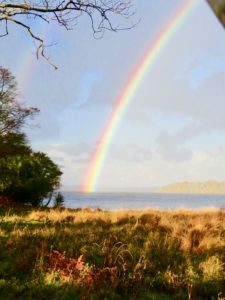 Of course, it rained – this is green Ireland. 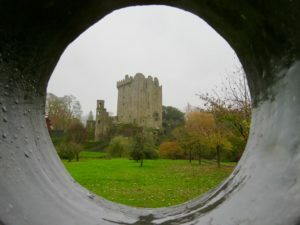 One day we were drenched to the bones while climbing the winding, narrow 110 stone steps to kiss the Blarney stone. The stone, by the way, is outside in more rain. Another day of laughter, not regret. Oh no, I thought as I looked ahead over the horse’s rump to the meadow we were about to enter. Rain showered down like a gray curtain and I was sure the deluge would ruin our perfect ride. The horse never hesitated and trotted directly into the downpour. We gasped at the site to our left. Not one, but two perfect rainbows. The most brilliant ones I have ever seen. Just when I expected disaster, God took the rain and created a miracle. My heart leaped as I praised God. All four of the elements – wind, fire, earth, and water – God is there. 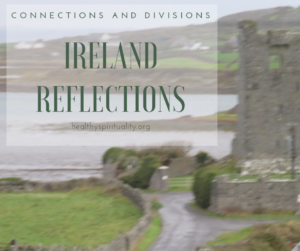 I never expected to be writing about divisions while reminiscing about connections found on this pilgrimage. 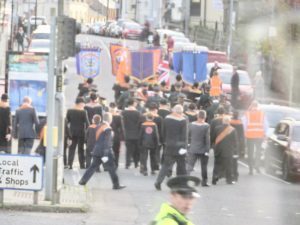 My heart broke to see the separation that still exists today, especially in Northern Ireland between the Protestants and the Catholics. 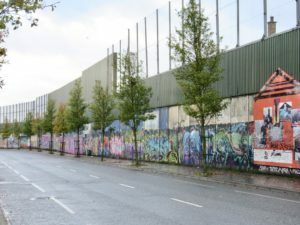 Hugh walls – higher than the Berlin Wall are erected between housing developments. Protest marches demonstrated their resistance. Graffiti screamed about human rights. I am sure God is there too in the midst of hate and mistrust but sadly I didn’t see his presence there. Christ when I sit down. On this pilgrimage I felt God’s presence yet in my heart, a wall still exists between us. My ego? My sense of not being good enough? My wanting to have the control instead of trusting? Probably all three. My prayer since I have returned? 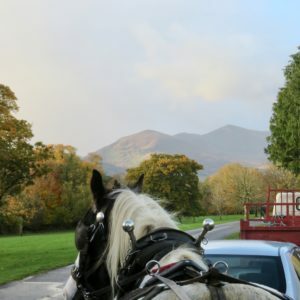 Thankfulness for a delightful amazing experience in Ireland. Peace between those divided in Ireland and elsewhere in the world. Connections and divisions. Points of transformation. How have connections and divisions shaped your life?